Blessedly devoid of stinging tentacles, or studded leather and loincloths for that matter, Razer's ManO'War review is a relatively simple stereo headset with support for virtual 7.1 surround. However, through a combination of style and great surround performance, it makes a bigger impression than its modest feature set would suggest. It all starts with Razer's typical eye for design. 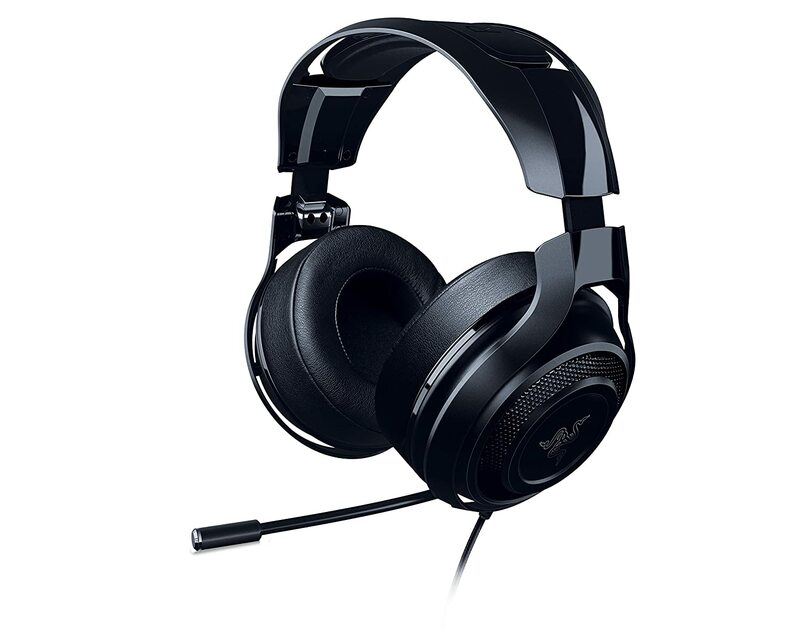 Matching the aesthetics of most of its recent products, the whole headset is clad in black, with a combination of glossy and matt finishes used throughout. The main Razer logo along the top of the headband is fairly prominent, but otherwise, the simple round earcups are only adorned with subtle, black- on-black triple-headed snake logos. Build quality is less impressive though. The whole shell is made from plastic, and although it's all finished to a high standard there are no particularly premium touches such as metal reinforcements, and there's no lighting on display either. ​When it comes to comfort, the ManO'War is light, but the cushioning on the headband and earcups isn't all that deep, making for a slightly loose fit that leaves more pressure on the top of your head. ​The sense that the ManO'War isn't an entirely premium product persists when it comes to features though. You get a pull-out, bendable microphone on the left earcup, but that's it in terms of on-headset gear Instead, volume control is handled by an line control that also includes a mic-mute button and hangs around 30cm down from the headset. It's a little small and fiddly to use, and it's also too easy to hit accidentally. More impressive is the braided cable itself, which is soft, pliable and free of kinks. The cable is also split into two sections, with the first being 130cm long and a second extension being 160cm long. The cables plug into the second feature that we really like about this headset, which is its really small and simple USB audio adaptor The headset itself is just a normal stereo headset that you could plug into any sound card, or even your phone. However, combining it with a USB adaptor makes it far more versatile. "The software has a game-changing trick up its sleeve - a calibration tool"
It works superbly, and as a result, the ManO'War was clearly the best virtual surround headset on test. True surround can still have the edge slightly, especially for sounds directly in front of and behind you, but the ManO'War comes impressively close. The ManO'War also held up reasonably well when listening to music and watching movies. The bass sounds a bit forced, but overall, you still get a satisfying and enjoyable sound. It can't match the Asus ROG Centurion's detail, but its sound reproduction is on a par with the other top headsets on test. Having the ability to fine-tune the virtual surround sound on this headset makes it an excellent performer. It also looks and sounds great. However, it needs to do more to justify its price of £120 inc VAT, and the clunky inline volume control and plastic construction don't do it in any favours here. With a price drop, however, the ManO'War would be a formidable headset.